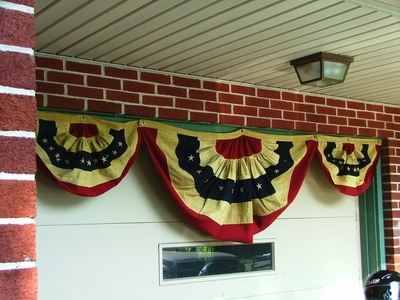 One Large 59" x 29.5" and Two Small 29" x 17" Cotton Tea Stained Flag Bunting - Total Span of 9.75 Feet. Perfect across a one car garage, or between your porch pillars!! Double Stitched Stripes and Embroidered Stars...VERY Thick and Well Made. Previous Customers are Raving about their purchase! Just like they used to make things...not a wavy thin fabric or nylon! Great quality with an authentic old-fashioned look - If you didn't know better, you'd think it was a family heirloom! This is made of very heavy cotton fabric, the stars embroidered and the stripes double stitched. This is not printed-on fabric like you find in your local K-Mart these are Top Quality. Tea Stained 100% cotton. This large bunting spans 59" across the top and 29.5" high. The small is 29" across and 17" high. Each includes 3 Brass Grommets across the top for easy hanging. Once you buy these you will enjoy them for years and years to come. Constructed to withstand the test of time. I'm certain you'll agree, once you receive your first set, you'll become as addicted as I am to these gorgeous girls! Washing instructions: Machine Wash Cold Separately, Low Iron, Line Dry. Even though labeled "indoor and outdoor safe", expect fading over time if used outside for an extended period of time.